The world, thanks in no small part to an incredible push by Microsoft, is excited about DirectX 12. The next generation API grants low-level access to a PC’s components, a greatly reduced driver overhead and a number of other improvements and innovations that promise almost console-like levels of efficiency for PC developers – that’s some serious potential. Microsoft is doing more than just pushing Windows 10 and DirectX 12 through marketing channels, however; many high-profile developers and tech wizards have thrown their weight behind DirectX 12 and vouched for it. 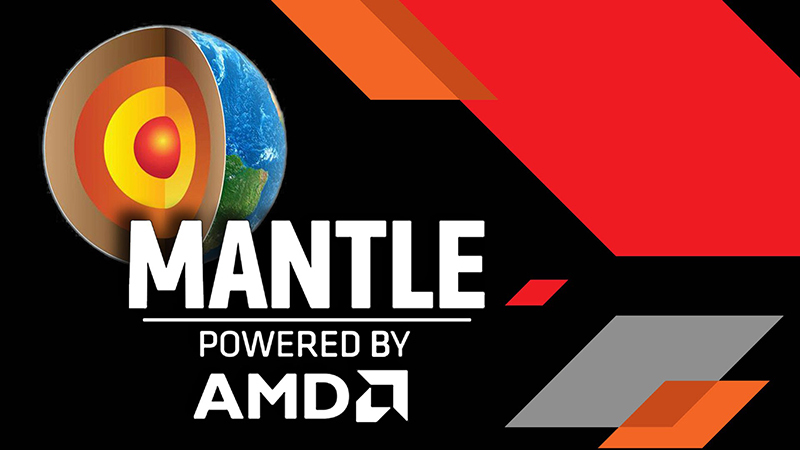 In fact, there are a number of DirectX 12 demonstrations that prove the API’s worth, and AMD’s own proprietary graphics API, Mantle, has taken a hit as a result. And it wasn’t all that long ago when many believed that Mantle would completely change the game. The benefits of Mantle were never quite realised. In their review of AMD’s latest Radeon wunderkind, the Radeon R9 Fury X, Anandtech stated that AMD is halting further GPU optimisation for Mantle. 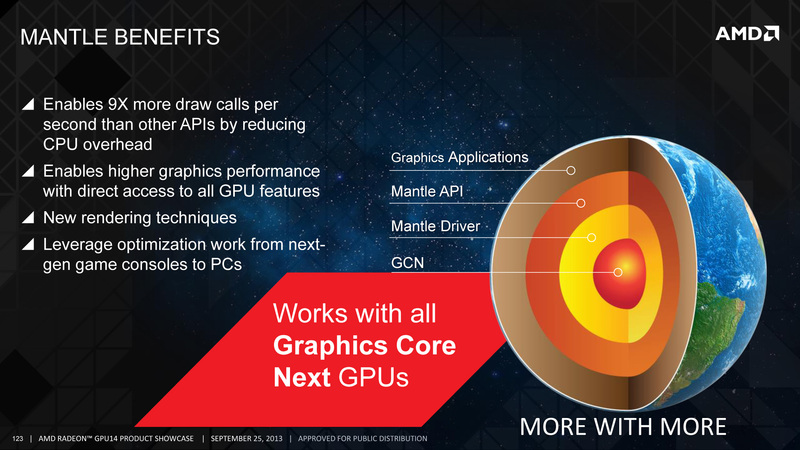 In fact, GCN 1.2, the latest revision of AMD’s GPU microarchitecture, hasn’t been refined for Mantle at all. “Of particular note, the Mantle driver has not been optimized at all for GCN 1.2, which includes not just R9 Fury X, but R9 285, R9 380, and the Carrizo APU as well,” says Anandtech. Mantle has slowly waned into irrelevancy since its initial announcement, and without support by triple-A titles, there really was no way Mantle was going to hold out. John Carmack, himself, suggested that Mantle would have no place in the GPU market without sustainability and longevity, and he was right. Vulkan looks to provide the cross platform compatibility Mantle simply couldn’t. Image courtesy of Khronos.org. Fortunately, Mantle wasn’t a complete waste. 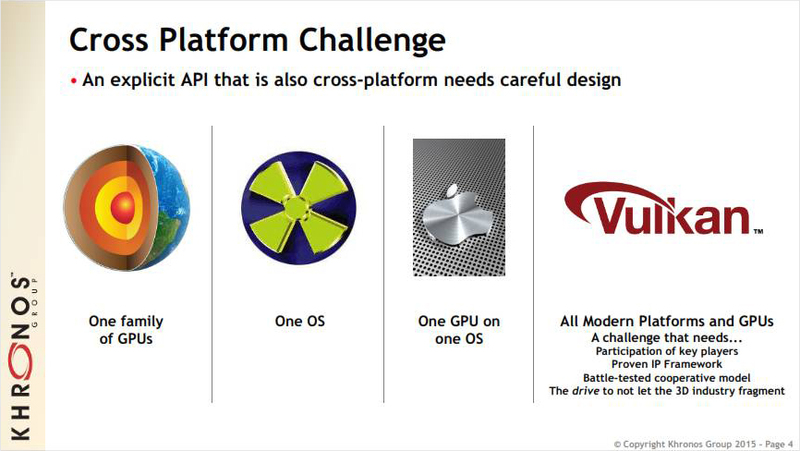 It’s been used in the development of the next generation OpenGL API, Vulkan. And as long as Microsoft is forced to compete with at least one other graphics initiative, the competition will keep DirectX APIs trucking along. For a complete overview of Vulkan, you can check out the API’s PDF summary here.